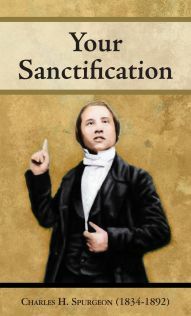 the children of God are here intended under the term “sanctified”; they are described as sanctified persons. What does this mean? We usually say there are two meanings to the term “sanctified.” One is, “set apart.” God has set apart His people from before the foundation of the world, to be His chosen and peculiar inheritance. We are sanctified by God the Father. There is a second signification, which implies not the decree of the Father, but the work of the Holy Spirit. We are sanctified in Christ Jesus by the Holy Spirit when He subdues our corruptions, imparts to us graces, and leads us onward in the divine walk and life of faith. But the word here, I think, includes both of these senses, and I must try if I can to find a figure which will embrace them both. And what is the apostle speaking about? In the ninth chapter he is speaking about the tabernacle, and the candlestick, and the table, and the shewbread, and the sanctuary, and the golden censer, and the ark of the covenant overlaid with gold, and the pot of manna; he is talking about priests, and about priestly things, and holy things; and he is declaring that all these things of which he speaks were sanctified things, but that though they were sanctified things, they wanted to be made perfect by the sprinkling of blood. Now, I believe the “sanctification” of our text is to be understood in this sense. There were certain golden vessels that were used in the sanctuary, which were never used for anything else but for the service of God. They were set apart, they were made holy, and they were kept strictly to be the vessels of the sanctuary of the Lord God. They were sanctified things. Again, in the sanctuary there were persons who did nothing else but wait upon the Lord. These were consecrated to their offices; for God chose the tribe of Levi, and out of the tribe of Levi, He chose the house of Aaron. These persons were chosen, and then they were prepared. They underwent certain ceremonies, and divers washings, and so they were made ceremonially holy. These priests were therefore sanctified persons, because they were set apart, dedicated, and reserved to the special service of the Lord God. Now, brethren, that is just what you and I are, and what we ought to be. We are sanctified persons: that is to say, we are chosen by God to be the peculiar vessels that He will use in pouring out His mercy, and to be the special priests whom He shall employ in His divine worship in this world. Christian men are not to be used for anything but for God. They are a set-apart people; they are vessels of mercy. They are not for the devil’s use, not for their own use, not for the world’s use, but for their Master’s use. He has made them on purpose to be used entirely, solely, and wholly for Him. Now, that is what is meant in this text by “sanctified.” We are sanctified persons, set apart for God’s use, consecrated, just as the vessels, the cups, the candlesticks, and the tables, and the altars of the sanctuary, were sanctified unto God and set apart for His service.